DC heroes and villains are reimagined as bikers in this new series inspired by the DC Collectibles statue line, Gotham City Garage Vol. 1! It's been decades since Governor Lex Luthor turned Gotham City into a modern utopia, saving his people from the devastation that made the rest of the continent a wasteland. But his city isn't paradise for everyone. If the Lexes Network misfires, and a citizen wakes up and steps out of line, the Bat and his minions are brutal in restoring the status quo. 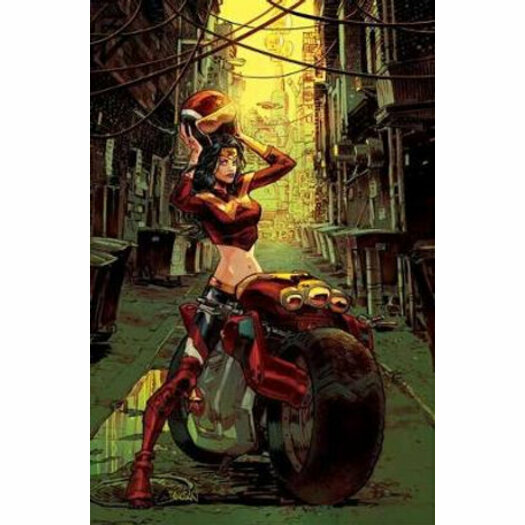 So when young Kara Gordon, whose ridealong tech has never functioned optimally, rushes headlong into the Freescape, she's shocked to find Gotham City Garage--where new friends might become family, if she lives long enough! A new world featuring the greatest characters from the DC Universe is born in Gotham City Garage Vol. 1! Collects issues #1-6.